Greg Keeffe (Big Flame): Punk happened, and then there was this incredible accelerated culture. ’78 was new wave, in ’79 you had the Specials, by ’80 you had Postcard [Records] and Gang of Four and the Slits. It was an incredible period of time. And then this goth thing happened, and I absolutely hated goth. I thought it was like heavy metal — a return to the bad old days. We were the antithesis of goth. Our raison d’être was to kill goth. Kev Hopper (Stump): For “Buffalo,” I came up with a bass line that was full of discords and slides. Mick had this silly idea that Americans were buffalo reincarnated, and ["Buffalo"] was a satire about Americans in London: “How do I get off the bus,” “Does the fish have chips.” I remember David Thomas from Pere Ubu disliking it. Nikolai Galen (the Shrubs): Every generation is unique, and every generation is less unique than it thinks it is. I hate the term twee, loathe it. I think there was a lot of sexism in the abuse we got from the music press, we were girlie we were fey, we were twee, they were all bad things, but they’re feminine rather than masculine things. Most indie labels still are and were then run by men, I was co-running as an equal, we were called Sarah, & that was all a reason to put us down. Quiet concerning really. That said, I hate all the childishness side of twee that a few people embraced, I always wanted to be a grown up, felt required to be a grown up, I’m not a fan of escapism. ‘We don’t do encores’ your press statement said on ‘a day for destroying things’. does a little part of you, if only occasionally, think well……maybe if…. Not really, not now. It was weird at first, and someone said to me soon after “… didn’t you used to be…?”, but it’s 17 years since we stopped, I’m 45. One of the things I thought was good (although in some ways I guess it was bad) was that we were kids the same age as the bands, give or take, in that sense we could never be a proper record label. It’s disappointing that nothing much seems to have changed, particularly with regard to feminism and the preponderance of bands or labels still to think the main role of women is decoration – a cool sixties chick on the sleeve or poster, some nice female backing vocal – and to fail to question what they’re doing and why. We tried to run the label we would have wanted to be consumers of, so we didn’t do limited editions or extra tracks or things designed to get people to buy the same record several times over, there’s a degree of respect for the audience and the fan that was completely lacking through a lot of the eighties and nineties – they were the little people essentially, and that’s a very Tory attitude. 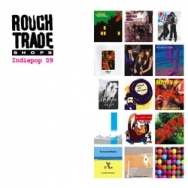 Rough Trade are releasing another indiepop compilation. Unlike the previous one, this one is not so much C86/Sarah/Postcard classics as music from the recent wave of indiepop. It's predominantly Swedish and British, though the recent wave of neo-C86 bands from New York (has anyone called this NYC86 yet?) is represented, as are bands from further afield (the Philippines' contribution is the excellent Moscow Olympics). The compilation is comes out on the 9th of November; you can pre-order it here. When I explained, almost none of them had ever heard of the June Brides (or even indie music). Although, having said that, I met my wife at our office and she had seen me play live years before, without realising that I was that same chap. Also, Tim Vass (the Razorcuts) and Mick Thackray (The Legend's brother and ex Swinging Soul Sister!) worked at The Treasury at the same time as me...It's a small indiepop world. Wilson mentions the civil service aligning with the left-wing principles of pre-Cool Brittannia indiepop (which stood in opposition to Thatcherism and its soundtrack of Lloyd-Webber, Stock/Aitken/Waterman and wine-bar sophistisoul; not to be confused with Britpop and recent "indie", which had been coopted by the smooth-talking Blairites) with the civil service, and equating a rejection of capitalism and the private sector with a rejection of the major-label system in the 1980s. Cherry Red, the record label that has perhaps done more than anyone else (with the possible exception of LTM) to keep Britain's 1980s indiepop heritage alive, is rereleasing The Shop Assistants' 1986 album Will Anything Happen, hitherto only available via furtively downloaded MP3s or ridiculously expensive eBay purchases. There's a new release from 1980s Mancunian indiepop group The Bodines, of all bands. It's not a new release, though; it looks like someone found some unreleased recordings of theirs from 1988, which Berlin-based C86 back-catalogue label Firestation Records has now packaged up into a 3-track EP, titled Shrinkwrapped. No idea what it's like, or whether it matches the soaring brilliance of Therese or Heard It All. The Manic Street Preachers' Nicky Wire talks to the Guardian about C86 and the "true birth of indie". Music history holds that nothing much happened in British rock between the rise of the Smiths (early 1980s) and the rise of the Stone Roses (early 1990s), but something did. For want of a better name, it gets called C86, after a compilation tape the NME put out that year. It was iconoclastic and human, and so fiercely independent it was kind of beyond authenticity. Some people have called it the true birth of indie, in which case this year marks its 20th anniversary. I suspect Simon Reynolds (who is on record as dismissing the time between post-punk being assimilated into "new pop" and the rise of acid-house/rave culture—i.e., the C86 era—as a wasteland) would disagree about the "true birth of indie", placing it back in the post-punk era. Though the two aren't disconnected; there are probably threads running from post-punk (in particular DIY mail-order cassette labels and provincial garage bands like The Homosexuals, not to mention obvious influences like Orange Juice) into C86. Even at the time, being into C86 bands felt like being part of a secret society. The scene was snobbish and elitist - although in a really good way. If the bands had icons, they always seemed to be slightly under the radar: record sleeves wouldn't have a picture of Andy Warhol on them, but of some girl who had hung around the Factory for a couple of days in 1966. It forced you to think a bit - to discover things. A couple of the bands went on to lasting success, including Primal Scream - who now seem really embarrassed about that era in their history. But most C86 bands had a lack of ambition in a really good way. There seemed no desire to make any money. Today's indie artists are well-groomed; in the C86 era, every band member had holes in their jumpers. It wasn't a punk thing, it was a poor thing. You also got the impression, looking at a C86 band, that a lot of these musicians were living at home with their parents. This was totally inspirational: here were people who were in a band and just like you. The ICA in London is marking the 20th anniversary of the C86 era with a weekend of live shows, exhibitions and film screenings. I'm not sure if we need these gigs to remember it. The thing I loved about C86 was the romance and doomed elitism: it felt like nostalgia even as it was happening. It's telling that none of the original bands have actually reformed to play at the ICA, and that none of the individual records have been re-released. That somehow makes it more special, more precious. Some things are meant to be rare. It sounds somewhat more polished than C86; perhaps because technology has moved on to the point where sounding lo-fi is an aesthetic choice rather than a technological limitation. Most of the songs on this compilation are electric-guitar-based, and fall into the broad "indie-pop" tradition, sounding not unlike a 7" single recorded in the north of Britain in 1988 or so, or possibly like a more polished version thereof. The Apple Orchard and Celestial sound like lesser-known Sarah Records bands, and A Place To Bury Strangers start off like a more lo-fi My Bloody Valentine, or perhaps Secret Shine, while Sarandon do their best impression of the skronkyness on the original C86. Meanwhile, the Love Letter Band have gone a lot more folky/countryish since I last heard them ("Even The Pretty Girls Take Medicine"). The compilation isn't all neo-C86 jangle-pop traditionalism; towards the end, it makes a concession to it being 2006, as the jangly-guitar/bass/handclaps formula gives way to more contemporary electronic sounds, with artists such as Compute and Bib combining synthpop sequencers with indie-pop sounds; meanwhile, Bobby Baby bringing a rather nice piece of understated folktronica to the project, and Cowboy X contributes some crunchy electro-pop not a world away from Ladytron or someone. Another article on C86, the lo-fi indie compilation that's 20 years old this week, this time on the Sweeping The Nation blog. Meanwhile, Berlin C86-influenced indiepop label Firestation Records, or perhaps Firestation Tower Records, (they're the ones who released the "Sounds of Leamington Spa" compilation CDs of late-1980s British indie-pop single releases, as well as various album rereleases from the same milieu) have released a compilation that could well be C06. Of course, they didn't have the gall to call it that, so it just has the rather generic title of "New British Invasion", and includes bands like The Pipettes and Vincent Vincent and the Villains, rather than the more generic and commercial Carling-indie that NME would have filled up any official C06™ with. C86 is a type of music, but what it describes is a contentious point. Its original meaning can be agreed upon at least. What it began as was a free cassette that came with issues of the British magazine NME in 1986 (hence, cassette 1986), later available for purchase as an LP through Rough Trade. Like its predecessor, C81, it featured a slew of up and coming indie acts. Unlike C81, this cassette's indie acts were far more indie and less established. Says NME's website: "We [tried] to invent an alternative scene - our own version of punk you could say - by forcing a coterie of new bands onto a cassette called C86. It's not entirely convincing and you should get out more if you remember The Shop Assistants - but it nails our colours to the mast. We, it said, for better or worse, are indie." Of course, NME is no longer indie, but twenty years of popularity will do that. Were C86 a cassette alone, it wouldn't merit much note now. But it became more than that. Although not all the bands featured on the compilation were stylistically similar, enough of them shared the same shambolic sound for C86 to quickly become identified as a particular genre, a movement, in independent rock. That sound is arguably twee, and definitively Jangly. Although many tweepop groups do grow from C86, the genre is, strictly speaking, jangle pop. Some have argued that, like Krautrock, C86 is more a time and place thing: late 80's British DIY indie, rather than a genre, but listen to the compilation, or any of the bands that became linked to C86 afterward, and you'll find that most of the artists have a shared, distinct sound (i.e. discordant feed-back laden guitars mixed with almost child-like vocalization of mostly cheery, sometimes political lyrics). Mocking Music goes on to examine each track on the NME cassette (side A and side B); the descriptions are somewhat brief and in some cases cursory to the extreme (and contain a few mistakes, for example, "Bullfighter's Bones" is named in one place as "Bullfighter Blues"), though they do include MP3 links, and does explain who Nerys Hughes was. IMHO, C86 is an interesting historical document, and worth a listen, though it is far from a list of either the best or most significant exponents of the zeitgeist that became known as C86. A handful of the tracks merit repeated listening (in my opinion, the highlights include Primal Scream's Velocity Girl, The Bodines' Therese, Stump's Buffalo, The Shop Assistants' It's Up To You and the abovementioned Half Man Half Biscuit song, (even though it's arguable nobody who hasn't lived in England during the 1980s has a chance of truly understanding HMHB, however, collecting their works and cribbing up on the soap actors and second-division football managers mentioned from online cheat sheets could be useful for Anglophilic oneupmanship); much of the rest is somewhat forgettable. On the other hand, I suspect that more recent NME compilations (Britpack anyone?) won't stand the test of time to anywhere near the same extent as C86 did. This looks interesting: the Institute for Contemporary Arts will be having a number of events commemorating the 20th anniversary of C86. The details aren't out yet, though there will be "evenings curated by unconfirmed C86 acts", including an exhibition of paraphernalia of the time, and a rumoured ATP-style live music festival featuring reformed C86 bands and new bands with connections to C86. The top 100 indiepop albums, according to an Italian website. The descriptions are in Italian, though the choices look mostly quite sound. The top 3 are C86, one of the Sarah Records compilations and Belle & Sebastian's If You're Feeling Sinister, which sets the tone and gives an idea of the aesthetic involved. The rest doesn't disappoint: The Jesus and Mary Chain's Psychocandy is #11, #13 and #14 are Orange Juice and The Pastels, Japanese pop band 800 Cherries have #21, The Hummingbirds' loveBuzz takes #55 (and I didn't think anyone outside of Australia had heard of them; perhaps the next one of these that comes out will name-check Clag or Mid-State Orange), meanwhile Lush's Split has #67, Slowdive get #89 (along with what looks like an arch comment about the decline and fall of Creation), and The Radio Dept. 's Lesser Matters comes in at #83. C86, a compilation tape released in 1986 by NME (then a more leftfield, not to mention left-leaning, paper than the meretricious publication we see today) ended up giving a name to a whole genre of shambolic, wet jangle-pop and influencing everything from Sarah Records to Belle & Sebastian to commercial alternative music, is now online in downloadable MP3 form. I can recommend Primal Scream's Velocity Girl, The Bodines' Therese, the Shop Assistants' It's Up To You and the surreal head trip that is Stump's Buffalo. The Half Man Half Biscuit track isn't bad either, though, not having grown up in England in the 1980s, I don't get the references. Actually, you may as well get the whole lot and make up your own mind. As someone pointed out in the comments, it's about time someone put up the preceding NME cassette, C81, which features significant post-punk/new-pop artists such as Pere Ubu, Orange Juice, Aztec Camera, Cabaret Voltaire and the Buzzcocks. And what is today's answer to C81 and C86? Well, don't look to anything quite so groundbreaking NME for it; the closest they'd give you would be things like NME Britpack, with the latest watered-down, sharp-suited Gang Of Four/Duran Duran copyists, tediously derivative retro-rockists like Razorlight and Yourcodenameis:Milo and, of course, Dionysiac Genius of Rock, Pete Doherty. The indiepop sound - in its classic form, an awkward collision between the Byrds, the Ramones and cut-price Phil Spector - has been asking, rather diffidently, for some attention for a while. Belle and Sebastian owe an explicit debt to the so-called "shambling" bands of the mid-80s, and the return of Morrissey this year suggests a renewed appetite for guitar music that champions uncertainty above aggression. Franz Ferdinand bear an uncanny resemblance to indiepop pioneers Orange Juice and Josef K. And now a new compilation in the excellent Rough Trade Shops series has brought together 46 songs that will catapult listeners back to 1986, the high water mark of indiepop. That sense of self-reliance was what punk had been meant to be about. Indiepop put it into practice: for all its apparent amateurishness, C86 made politics a practical matter. Even more importantly, it allowed women a place in music that more apparently ideologically sound movements had not. "The political aspect has been neglected," says Amelia Fletcher, who was lead singer with Talulah Gosh (and is now director of economic and statistical advice and financial analysis at the Office of Fair Trading). "It was very, very open to women. Although it wasn't overtly political, women felt involved because musicianship wasn't at a premium: you could make the music you wanted to the extent you were able." The very things the critics objected to - the childishness, the complete absence of testosterone, the Luddism - were political acts. What better way to reject the phallocentrism of rock than to deny masculine values? And why not invest the tired concept of the "generation gap" with some actual meaning by adopting badges of childhood rather than incipient adulthood? Btw, some people may find it amusing that one of the bands on Indiepop 1 is called Eggs.